Collaboration about mathematical concepts helps students identify, simplify, organize, express, and extend their thinking. These prerequisite lessons set the stage for productive and engaged rounds of Math with Someone, which is one of three authentic math activities that help students achieve their math goals. Select a topic below to browse supportive resources. Students choose from the activities on the Math Daily 3 board that will best help them meet standards and achieve their personalized goals. Many lessons and behaviors layer together to make partnerships smooth, enjoyable, and productive. Where to work, what to do, and how to support each other are just a few of the topics on which you’ll find information to support your instruction. Activites and games give students opportunities to explore fundamental number concepts, deepen mathematical understanding, and cultivate mathematical reasoning skills. Post the title of each game/activity on the math board after teaching it. Once foundation lessons have been learned, a joyful and successful launch can commence. Primarily activity based, Math with Someone provides students with an opportunity to talk and write about mathematics, and to describe and explain their thinking to peers. This collaboration helps students identify, simplify, organize, express, and extend their thinking. Through this systematic, explicit teaching, all students develop independence and build stamina for this valuable activity that fosters cooperative learning and success. 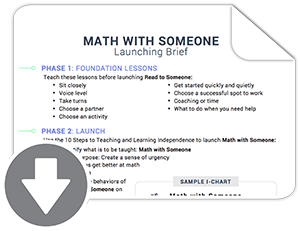 This one-page guide will help you remember what foundation lessons to teach before launching Math with Someone and what essential behaviors need to be placed on the I-chart. The popular card game War has been revised a bit to support early number sense as well as counting and cardinality. Math Writing and Math with Someone activities.